There are a lot of goodies in the GOP platform for Coloradans to celebrate, chief among them is the party’s desire to make sure endangered species are protected because the animals are actually endangered, and not because environmentalists want to stop progress. 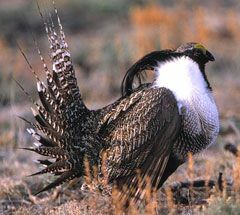 The platform specifically mentions the sage grouse and points out that if the species enjoys healthy numbers in numerous states, that does not fit the bill of being endangered. It’s a policy that makes sense, and is in keeping with the intent of the law. Instead of actually protecting species, environmentalist and their supporters in the Democratic Party are more interested in blocking progress and stopping development. What’s even more egregious, is that officials in government are now complicit in lawsuits brought by green groups through a tactic known as “sue and settle,” to list hundreds of species at a time to the protective law, behind closed doors. “That deceit betrays the public’s trust; it will not longer be tolerated,” the platform said. As an added bonus to the public, Republicans say payments made to activists in these deals must also be disclosed. We wholeheartedly support the platform plank detailed under the party’s plan for natural resources, agriculture, energy and the environment, and will continue those detail those efforts this week during the party’s national convention.